I started the group on 13th March, 2003 and we are still going strong. Our Yahoo Group postings wane a bit from time to time, but we still have most of our founding members and a lot of them still post at least once a week. 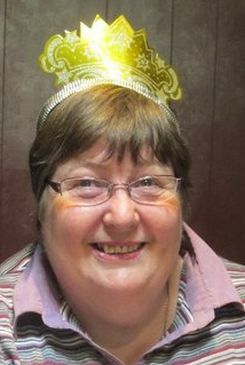 Being in the Yahoo Group is like chatting to very old and dear friends each time anyone posts. We feel each other’s sadness at losses and happiness at new life, new love and new achievements. We still have our Christmas swaps, challenges, etc. and have restarted our bear making days after dropping them for a while due to everyone being so busy with work, new bubs and other life things…maybe we all need a break every now and then, but now the bear making days are well attended again. And most important of all, in the group, we motivate each other. When someone has finished a new project, it inspires us all. Those of us who had lost motivation or gone a bit stale, all of a sudden feel that flutter of inspiration coming to life again and off we go and create another gorgeous wee friend. We are still making comfort bears for breast cancer patients which are still very well received by the breast care centres. We supply them to be given to women whose cancer has metastasized to give them a little bit of comfort; after all, that's what teddy bear do. This is a very special project for us and very dear to our hearts. 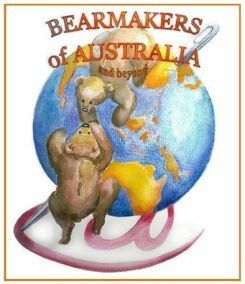 Many of the Yahoo bear groups have disappeared into oblivion, but we are still alive and well. We would welcome new members as well; the more, the merrier! 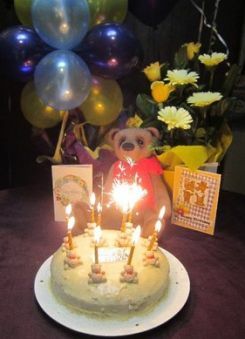 Yummy cake decorated with bears! 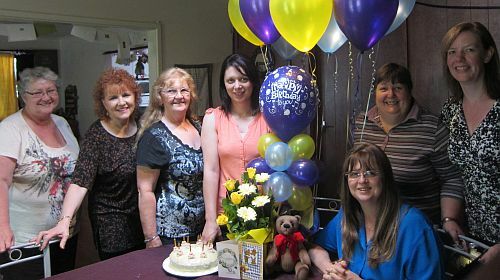 The bear behind the cake is a Comfort Bear made by Heather. See below for details. 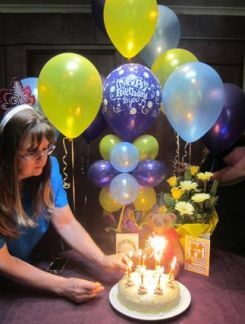 Heather Harwood, co-owner of the group and member since 2004, had the honour of lighting the candles on our birthday cake. 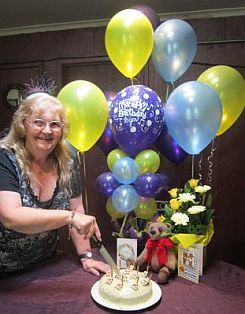 Beryle Tidey, founding owner-member of the group, cutting the cake. 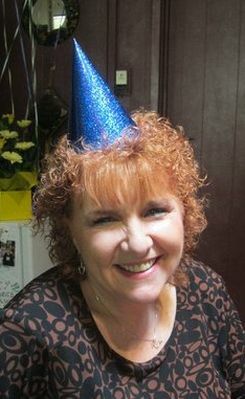 Modern technology brought members into the party group through Skype. 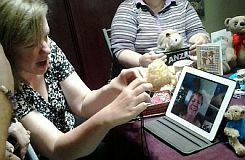 We Skyped with Gayle Carmichael in New Zealand and with Susan Mason in England. We had numerous phone calls from those who could not attend because of work schedules. Rosalie Carpio, member from Hong Kong, on holiday visit to join us. 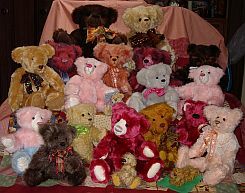 Our comfort bears are made from different patterns depending on who is making the bear. Some use their own pattern, others use a commercial pattern or we supply a pattern. 4” and 6”, just enough for a handful. When the bear is complete we add a hang tag which tells the recipient someone is caring about them and that the whole group is sending love and comfort in the form of this bear. The tag includes the name of the artist/bear-maker and the bear’s name. We also add a small charm around the bear’s neck, usually an angel or a heart, in either silver or gold tone.